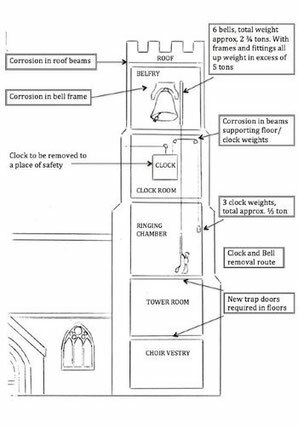 Install trap-doors in each floor of the tower to allow access, and the removal of clock, bells and frame. Remove the clock to a place of safety. Remove the bells and the old frame. Modify the footings in the belfry to accommodate a new frame in such a way that it will be less susceptible to corrosion. Build and install the new frame. While they were away, the bells and the clock were overhauled to ensure they will continue to serve the village community for many years to come. The clock was converted to electric winding at the same time. The work on the bells and bellframe was carried out by the Whitechapel Bellfoundry. The clock was overhauled by Cumbria Clock Co.. Other structural and preparatory work was carried out by Elliott Construction, a local building firm.